Happy fall, everyone! It’s been a bit of a weird start to fall, it seems. Our first few days of fall greeted us with unseasonably cool weather and we got to enjoy the mid 80s for a few days, while everyone east of us had a heat wave! Fall is one of my most favorite seasons, though we don’t really get what some consider fall weather until almost winter. What I love most about it is the memories made during the season. 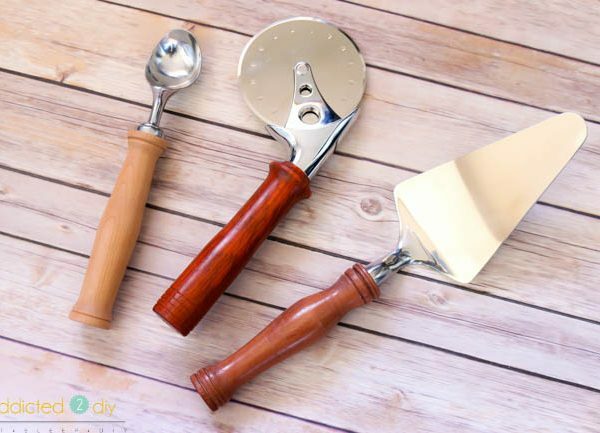 Fall baking and other traditions, Halloween, Thanksgiving, etc. I have so many happy memories of fall as a child and I strive every year to try to create special memories with my own children. 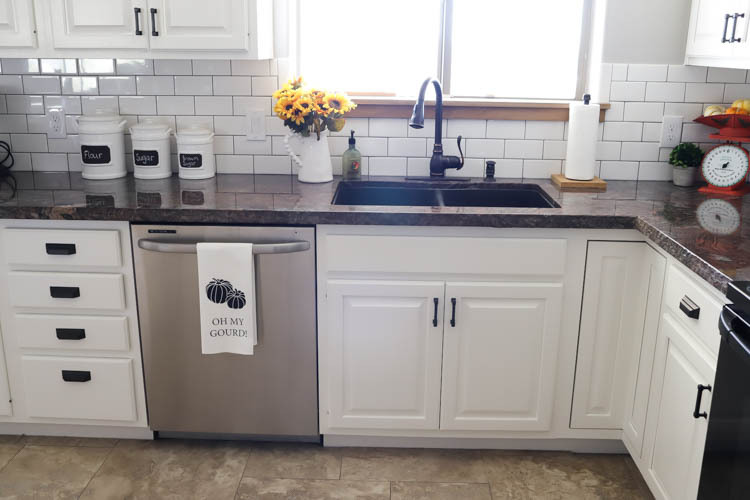 It’s been a while (3 years to be exact) since I’ve participated in a fall home tour, but when my friend Brittany from Pretty Handy Girl asked, I knew it was the perfect time to share one again! 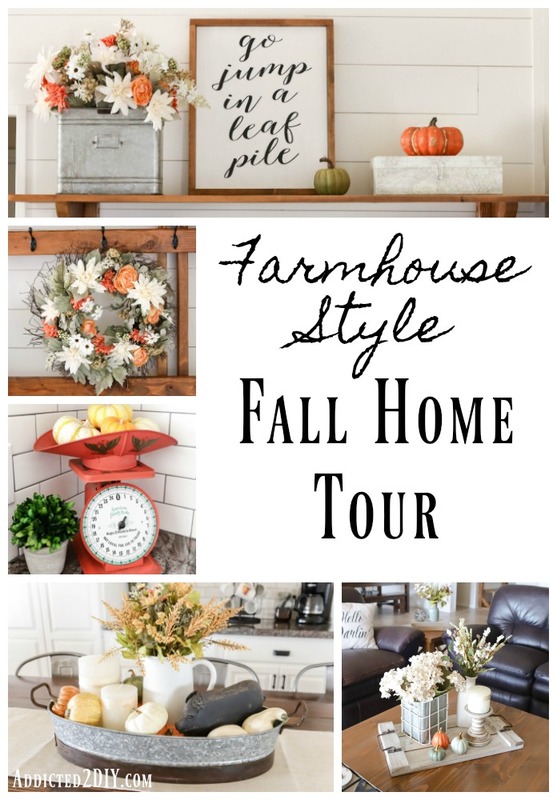 I’m sharing links for everyone else participating at the end of this post, so be sure to stop by and “visit” their gorgeous fall homes as well! When it comes to fall decor, I don’t go all out like I do for Christmas. 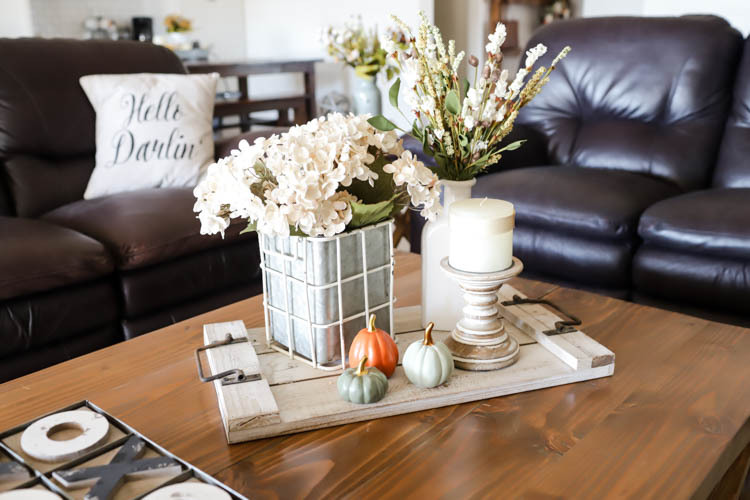 I tend to keep things simple and make small swaps in my decor to bring the fall season to life in my home. I seem to build on my decor every year, though, so I’m sure it won’t be more than another year or so before it looks like fall exploded in my house. With that being said, let’s get started with the tour, shall we? We’ll start with the front porch since that’s where most people enter our house. I opted to NOT purchase those cute mini straw bales this year, which really bummed me out, but something(s) was burrowing in them last year and it became a HUGE mess all over the front porch. Not to mention a frightened me poking them to see what would jump out at me when it was time to throw them away. Instead, I utilized the faux pumpkins I bought last year as well as the faux galvanized pumpkins I made. I bought some mums from Home Depot, because it just doesn’t feel like fall without mums. Plus they add such a pretty pop of color. 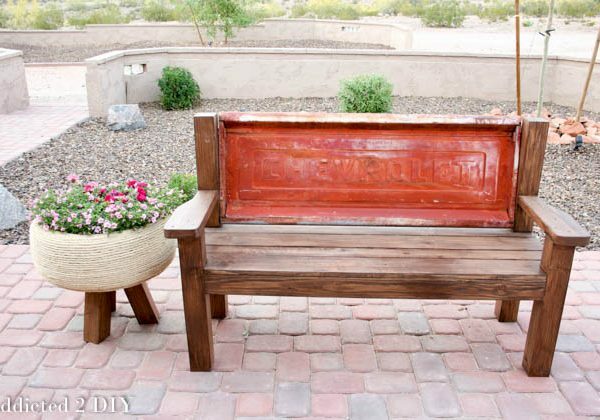 The bench is one that my uncle made for us for Christmas several years ago. 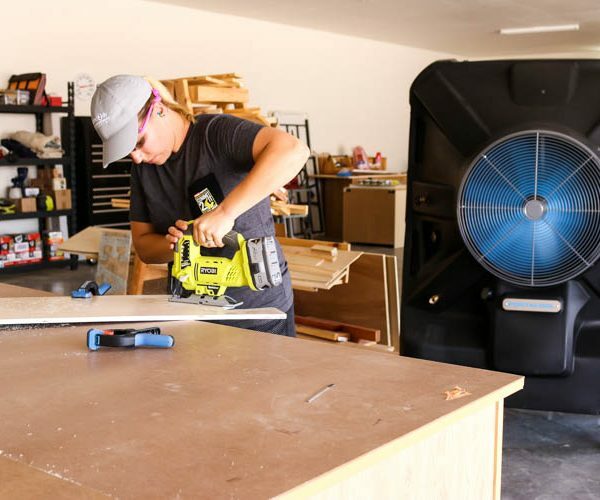 We’ve refinished the wood a few times, but have been a little lax lately. Now, though, has a perfect weathered grey color, so maybe our neglecting it was good??? When you walk into the house, you’ll find the hall tree that I built earlier this year. The wreath that jumped into my cart at Michaels was the main starting point for this decor. 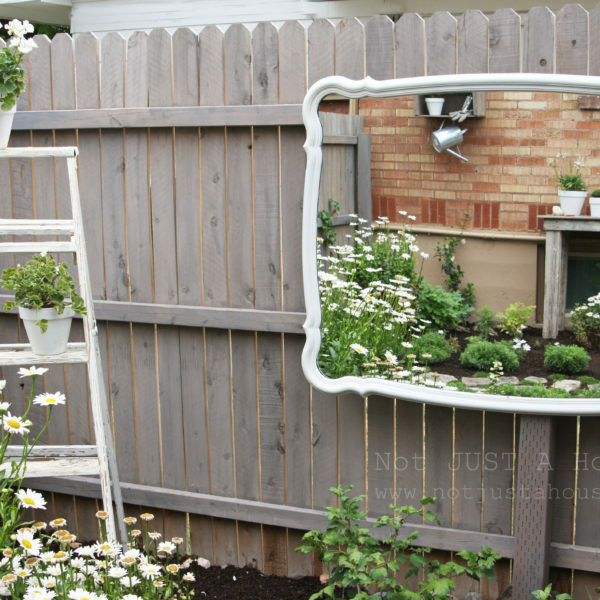 The end result is a blend of some DIYs, some decor I already had, and a couple of new purchases. 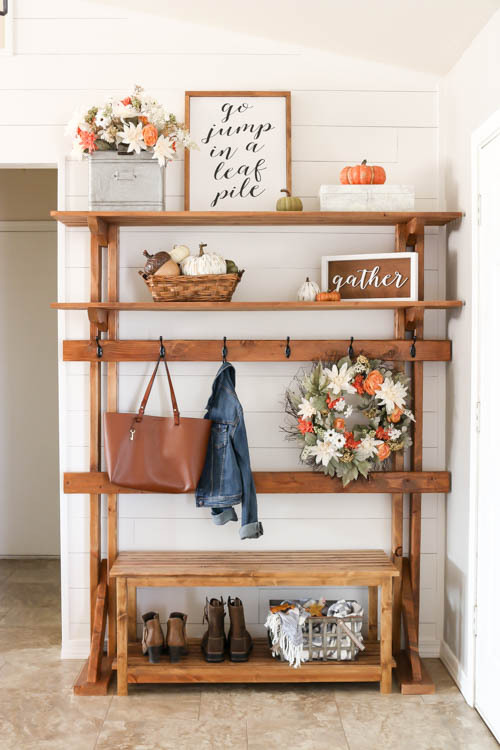 I actually dedicated an entire post to my fall entryway, which you can find here. 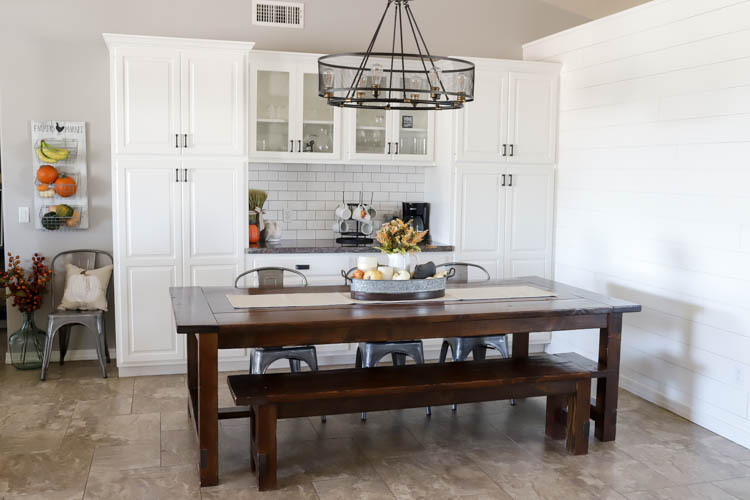 Our house is a completely open concept floor plan, so you are able to see just about every room as soon as you walk inside. We’ll go ahead and make our way to the great room. Again, with just a few very minor switches, I was able to give the great room a touch of fall flair. The flowers are a bit more neutral than I normally go with fall foliage, but I just loved how pretty they looked. They also went perfectly with the little ceramic pumpkins I found in the dollar spot at Target. Moving over to the dining room, you can see that I started moving back towards the more traditional colors. I bought some seasonal veggies, which actually prompted me to cook acorn squash for the very first time and it was a big hit with my oldest son. My husband and youngest son decided they’d rather have salad;) I’m bound and determined to bake pumpkin pies 100% from scratch this year, rather than buying canned pumpkin puree, so I also bought a few pie pumpkins. 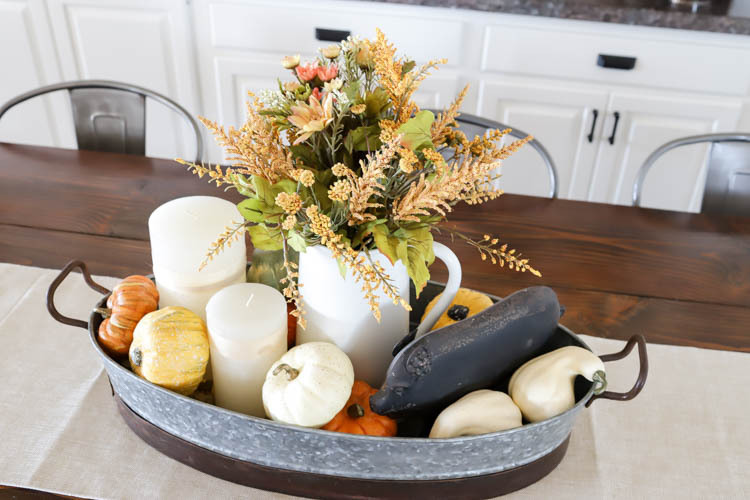 For the centerpiece, I simply swapped out the greenery with some fall floral stems and also added some mini pumpkins and gourds to the galvanized tray. 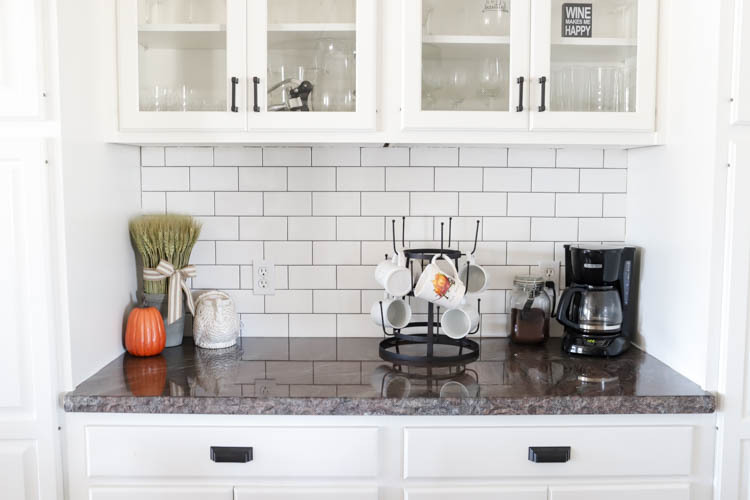 For the counter behind the dining table, I brought out my favorite fall Scentsy warmer from several years ago and added some wheat and pumpkin decor. I also found a pretty fall coffee mug at Pier 1 that I knew would get a lot of use this season. 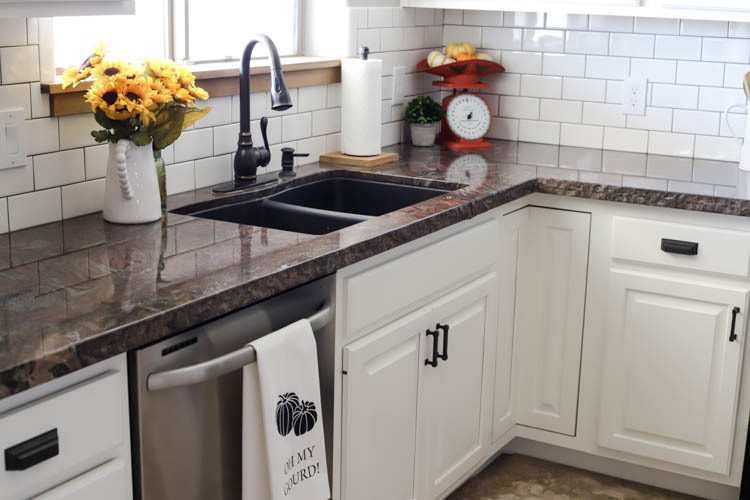 Moving over to the kitchen, I made a few minor swaps to add a little fall flair. I couldn’t resist making a new towel for fall, which I think I may also add to my Etsy shop this season. 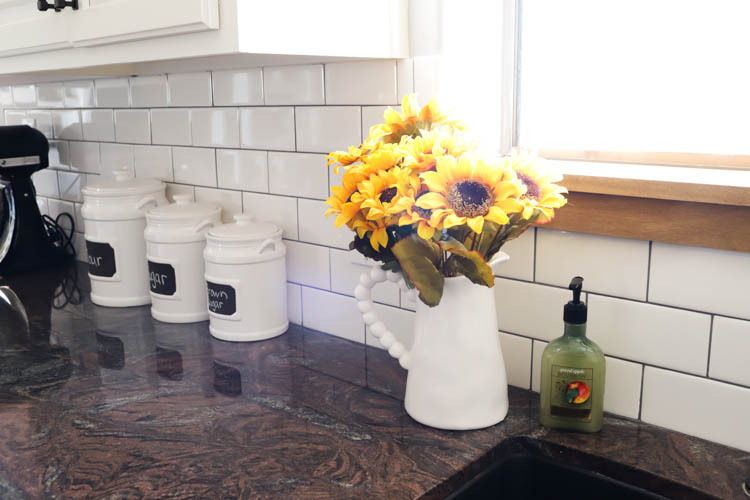 I also added some sunflowers to the pitcher by the sink. 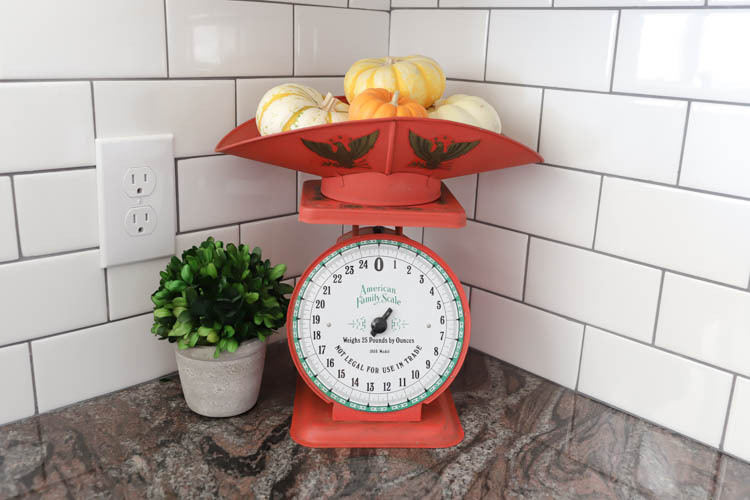 I bought this vintage scale in an auction a few years ago and probably paid way too much for it, but it has ended up being the perfect little place to hold mini pumpkins. To top it all off, I swapped out the soaps in the house with some of my favorite fall scents from Bath & Body Works. I have a teeny obsession with that store, so any time soaps and candles are on sale, I’m first in line! 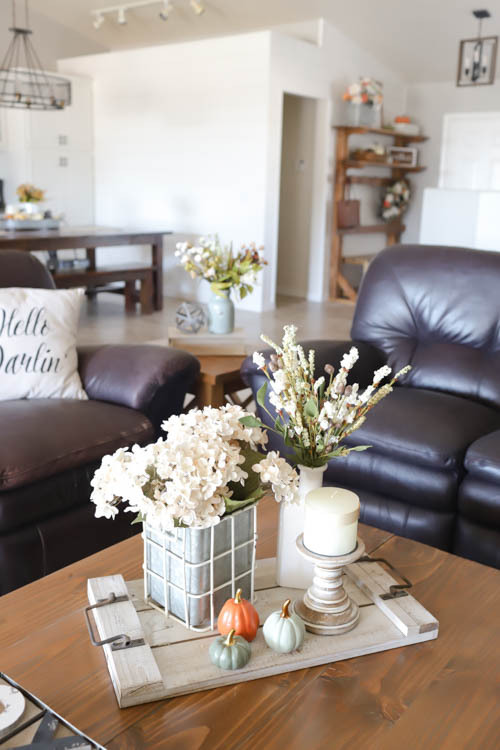 Thanks so much for stopping by and taking a peek at how I’ve decorated my home for fall. I hope you enjoyed it! 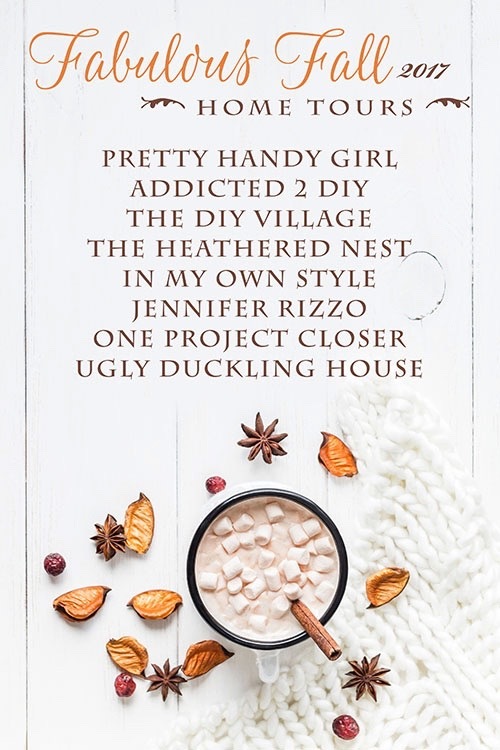 There are 7 other incredibly talented bloggers also sharing their homes with you all today and you can find all of the links to their homes below. I know you won’t be disappointed! I hope you all have a happy fall season! I love that bench and wreath! what a wonderful gift from your uncle! Thank you Jocie! Yes, he makes us some amazing gifts every year. We love them! 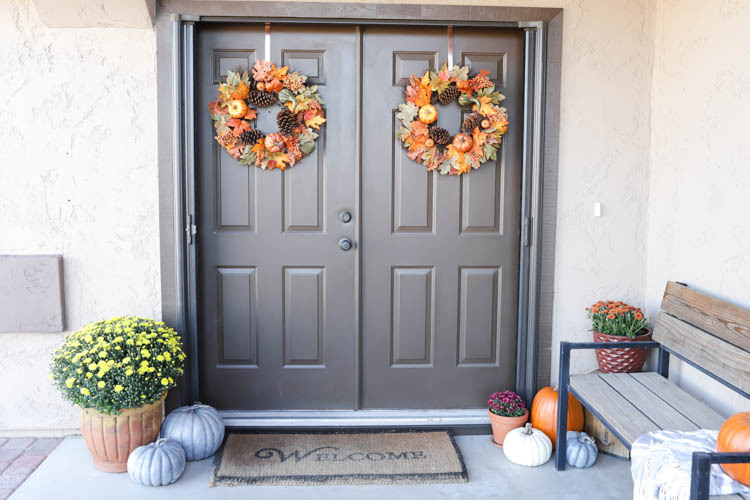 It all looks great, but that entryway situation was made for fall! Thank you! I agree. I may or may not have built it partly because it would be perfect to decorate for the seasons! 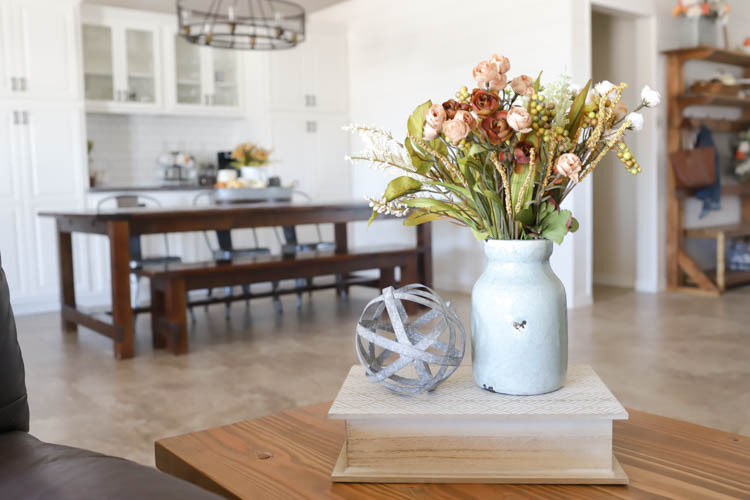 Katie, your home looks beautiful! How did I miss your hall tree before? Love it!!! I was so excited to decorate with them, too! Who knows what was burrowing in there, but they sure made a mess!